Sober Look: Securitization of eurozone sovereign debt - European "safe bonds"
Securitization of eurozone sovereign debt - European "safe bonds"
An open letter written last fall by a group of academics proposed a simple securitization structure of the eurozone sovereign debt. At the time it did not get a great deal of traction, but as ESM comes online, it's an idea worth some consideration. First of all the group points out the interconnectedness of sovereign credit and bank credit in Europe. Since the European credit markets are dominated by loans as opposed to the US where corporate bond markets are well developed, tight credit conditions in the banking system can have enormous implications for economic growth in the eurozone. At the same time banks hold tremendous amounts of sovereign bonds as well as each others' debt. 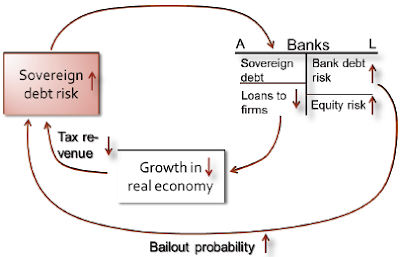 This tight feedback loop between governments and banks creates a potential for rapid crisis escalation. To address this issue one needs to decouple banks from sovereign risk. This must be accomplished without having the eurozone "core" provide direct support to bonds of the "periphery". The idea this group is proposing is to pool sovereign debt to create some diversification and set up a "first loss" tranche that could be held outside of the banking system. The goal would be to create an independent entity that has no direct support from the ECB or ESM. 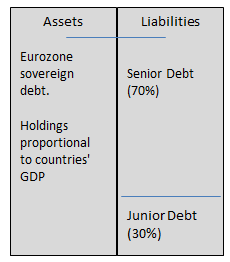 The entity would purchase sovereign debt in proportion to the GDP of the member states. These purchases would be financed by issuing two tranches of debt: senior - held by banks and junior sold to private investors. The ECB would allow banks to hold the senior tranche at zero risk weight encouraging them to swap out of their concentrated sovereign exposure (Italian banks holding Italian government bonds creating the feedback loop, etc.) and into a diversified exposure with significant loss protection. The authors have done a great deal of stress testing analysis with some fairly conservative assumptions. They point out that with say a 30% subordination the senior tranche they call European Safe Bond would be more secure from the credit perspective than the current German government debt. The question of course remains as to who would buy the junior tranche. But if the junior tranche has a yield of say 10%, a whole new set of private buyers may have an interest in participating. It effectively becomes the eurozone's sovereign high yield bond market. Depending on the term structure, there could be numerous buyers both within the EU or outside - from hedge funds to sovereign wealth funds and even mutual funds and ETFs. The group suggests having EFSF/ESM become a "market maker" for the junior bonds to avoid market disruptions. Given that EFSF already holds sovereign bonds, this wouldn't be too much of a stretch. It's a simple idea that got too little attention in Europe. As the eurozone leadership works through the structural components of ESM, they should give securitization of sovereign debt some consideration.